The KONG Cat Laser Tease is a fun toy rod for cats. This rod is made extra challenging with the integrated laser light. It immediately challenges the hunting instinct and curiosity of the cat. 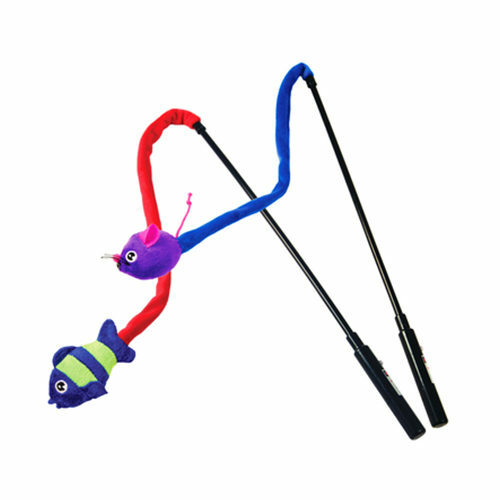 A toy that is fun for the cat, but also for the owner. The KONG Cat Laser Teaser motivates the cat to get exercise. The combination of a rod and laser light is perfect for challenging your cat. By wiggling the rod and shining with the laser it is easy to keep your cat active. A perfect combination of toys to happily play together. A small stuffed animal dangles from the end of the rod, which can be hunted. The KONG Cat Laser Teaser is available with two different figures. Mouse or fish This product is delivered in an assortment, you cannot indicate a preference for a figure. Have you used KONG Cat Laser Teaser before? Let us know what you think about this product.